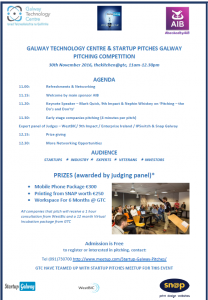 GTC and Start-up Pitches Meetup Galway are running the second annual pitching competition for Startup companies (business trading for less than 12 months, pre-trading companies welcome) in GTC on November 30th at 11 am. They will be recruiting 6 – 8 early stage companies to carry out a 4-minute pitch of their business to an expert panel of judges competing for great prizes including office space, a mobile phone package, and printing vouchers. The event is free to attend; refreshments will be served, and there will be plenty of networking opportunities for contestants, audience, and judges. Full details, entrance criteria, and an application form are available on the Galway Technology Centre website.